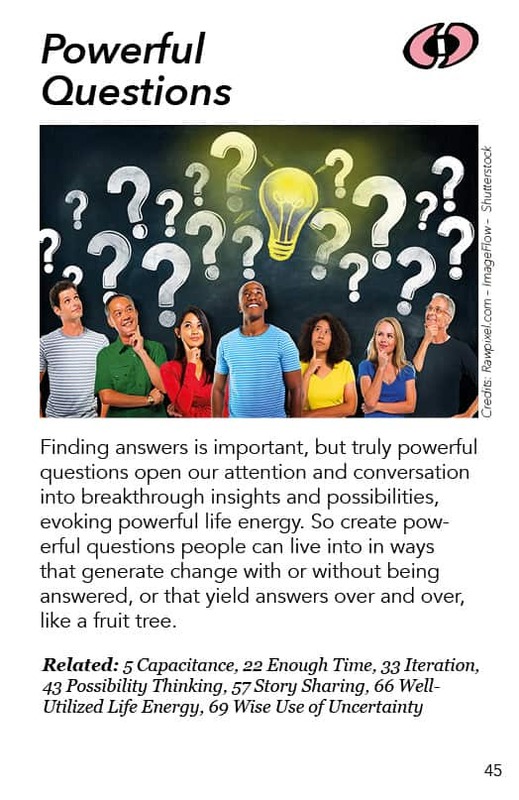 Finding answers is important, but truly powerful questions open our attention and conversation into breakthrough insights and possibilities, evoking powerful life energy. So create powerful questions people can live into in ways that generate change with or without being answered, or that yield answers over and over, like a fruit tree. Usually people think a question is something to get an answer for, and that’s what we do. You have a question, so you find the answer. It is like there is a vacuum there inside the question, an empty space that motivates us to move in the direction that the question is pointing us to. But the most powerful questions don’t move us towards a point. They open us up into a space. They focus our attention not on a point but on a particular realm of inquiry. We can go there individually with our attention and our thinking and our feeling, or we can enter into it collectively in conversation. The more powerful a question is, the more it leads us in directions where we discover new understandings and new possibilities. I like to think of it as focusing attention, but it’s focusing our attention into an energized space – a territory or region of life which has energy and mystery and potential in it. It is very interesting to study the structure of that question, how it opens up into a space of possibility. It draws your attention into a place where you actually might make a breakthrough. New ways of thinking come naturally out of that question. Since it is a zipper question, you could also ask, “What could a pattern language also be?” or “What could a democracy also be?” You can go into some very interesting and unpredictable places asking a question like that. And yes, a different group will give different answers, but there’s juice and life in there regardless. The expansion of possibilities is more important than any specific answer. And then there’s the idea of “living into questions”. What would it be like to spend a day with a group asking, “What could our group (or our community) also be?” You would come up with great ideas, of course. But what if people were then invited to continually think about this and feel into it and share their insights for weeks or months on end? Many people live into questions without realizing they are doing that. They may ask “What is the meaning of life?” or “What is art?” Some of these questions don’t have any answer you can nail down, but you can live into them fruitfully if they call to you, if they matter to you. You can treat the question like a fruit tree, harvesting new answers from it over and over and over and over again. Activist author Fran Peavey created a practice she called strategic questioning – asking questions that have leverage for change. In the morning she would sit and meditate with a globe and ask “What is the greatest service I can do today for the world and for future generations?” She was living into that question. She is also one of the first people to point out that questions can generate change without even being answered in the usual way. For example, she was working in India and trying to help clean up the Ganges. It was an awkward thing to try get people to clean up the Ganges. The Ganges is considered sacred but it’s also full of dead bodies and human feces, so it is a real mess. So how do you talk about it? She noticed that she was the only woman in all the meetings about this. So she asked, with real curiosity, “Where are the women?” She did that two or three times. And a day or two later – without anyone answering her question – suddenly there were a bunch of women at the meetings. She wasn’t judging the men or evaluating their culture. She was just strategically curious. The men – who respected her tremendously – had to go through this patriarchal dynamic in their heads and work through it to the point where they recognized there was a problem, and then they brought the women in. Don’t ask questions that can be answered with yes or no. Ask questions that cause people to think – and to feel. Don’t ask a question that has one answer. Ask open questions with many possible answers. Learning how to ask open questions that draw people out, that deepen their thinking and feeling – that’s what this this pattern is largely about. As I mentioned, World Café is very powerful. The book The World Café by Juanita Brown, David Isaacs and the World Café community shares more than a 100 sample questions in the text as it describes the World Café process and its implications. Strategic Questioning Fran Peavey wrote a booklet about it and there’s a lot of information about it online. Appreciative Inquiry: AI gets beyond looking at a problem as a problem by looking at when the realm where the problem exists was handled well. It asks questions with the people involved in the problematic scene. They interview each other and evoke memories and visions about what would be possible, what would make sense to do there. Appreciative Inquiry interviews clarify things people would like to have happen in that realm, including all the positive dimensions of it. 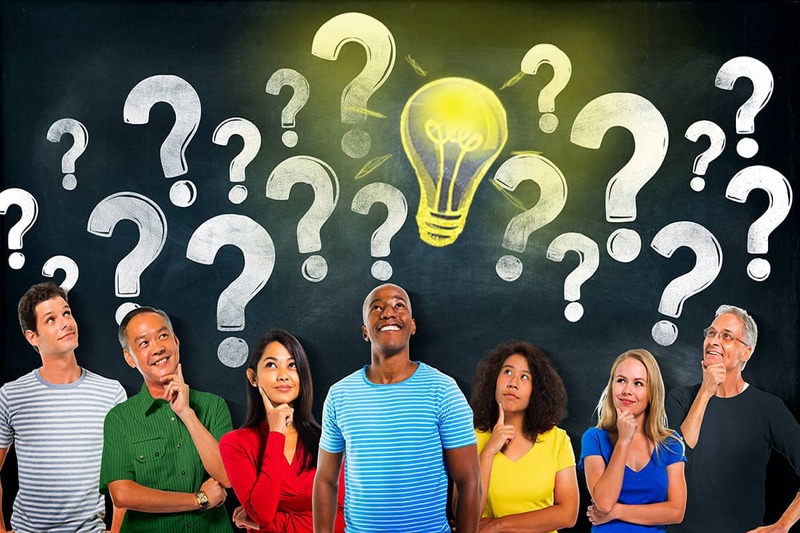 Dynamic Facilitation: A dynamic facilitator uses a few very strategic kinds of questions like, “What’s your concern?”, and really wants to know. They’ll ask that question of somebody who is creating a disturbance or throwing adversarial energy into the group. This powerful question reframes their objections and disruptive energy as something containing a valuable but hidden gift. The disruptive person has a piece of the group’s puzzle which is showing up as a concern – and a concern is a much quieter energy phenomenon than antagonism. After they have said their concern, the facilitator will probably ask them, “If you were in charge of the scene, what would you do?“ Notice the energy shift that happens with that question, a shift towards possibility. Quakers have questions – often moral questions called “queries” – that they live into. During the Vietnam War when I was part of a Quaker Meeting there were many issues that troubled people in our congregation. Quakers are largely pacifist, but many of them were strongly anti-Communist. They believed in the domino theory – that if Vietnam “fell to the Communists” then other countries would follow them and many people would end up oppressed by the Communist system. So they were caught in a quandary, between their pacifistic inclinations and their sense that this Communist threat needed to be stopped. And so a query was often offered into the larger Quaker Meeting, like “How do we respond most creatively to the issues raised by the Vietnam War?” People would reflect on that in the silent meeting for worship and also talk with each other afterwards and in business meetings. So it was held as a question by the larger group together for ongoing reflection.